All transactions are safe and secure with a reliable history in online purchasing behind each of our associates. 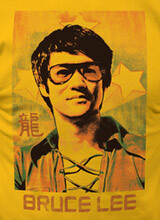 Buy the Bruce Lee Shades shirt to own Bruce Lee clothing and merchandise. This Bruce Lee tee features a distressed image of Bruce wearing sunglasses. It demonstrates that Bruce looked cool even when he wasn't on screen fighting. In the background of the design, you can see several star bursts. Let others know that the Dragon was more than just an ordinary celebrity. The design can be worn under your favorite Bruce Lee hoodie. Look for similar women's Bruce Lee shirts. This design is a unique tribute to the legend. In addition to the Bruce Lee Shades tee above, browse the Bruce Lee Clothing Gallery for more apparel like men's and women's clothes, kids shirts or hoodies.